Maximize benefits this lifestyle card gets you from over 700 establishments in Manila, Cebu, and Boracay--through your mobile phone. Cosmo chicks who are always on a budget are also always on the look out for the best deals and bargains. Why pay more when you can get the best at a discount--when you can get something for free even? That's why we love sales, right? But if you don't want to have to wait for sales all the time and would like to enjoy perks and discounts from several of your favorite establishments anytime you need to, then you may want to get an Enjoy Philippines card. For the tech-savvy and mobile phone-dependent among you, you'd be happy to know that taking advantage of the best deals in town can now be done faster and more conveniently with EnjoyPH, the mobile application of the Enjoy card. 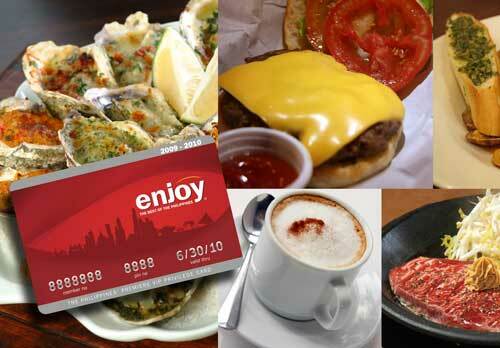 If you are not familiar with the Enjoy card, it is the country's premier lifestyle card that offers over P250,000 worth of treats, discounts, and freebies from over 700 partner establishments in Metro Manila, Cebu, and Boracay for only P1,995. To date, it is among the fastest growing loyalty and privilege marketing programs with more than 40,000 members nationwide. With the Enjoy card, you can expect to get free makeovers, discounted (or even FREE) delectable dishes, cheaper rates on travel accommodations, great shopping bargains, and even access to the Metro's hottest events! And to help card-holders maximize their membership experience and for non-members to sample the benefits the Enjoy card has to offer, Enjoy launched a free and easy-to-download mobile application: EnjoyPH, which also offers its own incentives and freebies. Perfectly complementing the Enjoy card, EnjoyPH serves as the mobile guide that provides detailed information about Enjoy's partner merchants. This application can be downloaded through and is compatible with an iPhone, Nokia, Sony Ericsson, and Samsung smartphones (those that allow you to download such applications specifically for mobile through Wi-Fi). EnjoyPH also keeps both members and non-members updated on the latest seasonal promos and happenings, as it streams the latest news and updates about Enjoy partners. You can browse and search detailed information about your favorite establishments throught its complete directory. It's so easy to get the information you need--which even includes directions to establishments! Now you don't have to be bad with directions--at least going to those places you really love to visit. EnjoyPH features Google map integration and the phone's GPS-based Near Me features to locate the nearest partner merchants around you. No need to fugure out what to do and where to eat. This application helps you do just that. Can't wait to access the best finds in the metro and beyond? Try EnjoyPH and be convinced to experience only the most exclusive perks and discounts with the Enjoy card--that is, if you don't have one yet. To learn more, visit www.enjoythebest.ph or call (02) 7509258.